The end of the week and early part of the weekend will be much cooler. 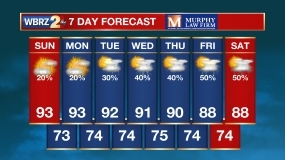 Though rain chances are out, clouds will be persistent. Today and Tonight: With stiff northwesterly winds, warming will be tough to come by on Friday. Behind a front, clouds will linger with temperatures not doing much better than the low 50s. Some spotty sprinkles may pop up but nothing substantial is expected. Overnight, the north breeze will continue and send thermometers into the low 40s. If not for a continued cloud deck, the mid 30s would be possible. Up Next: Below average temperatures will continue through Saturday. 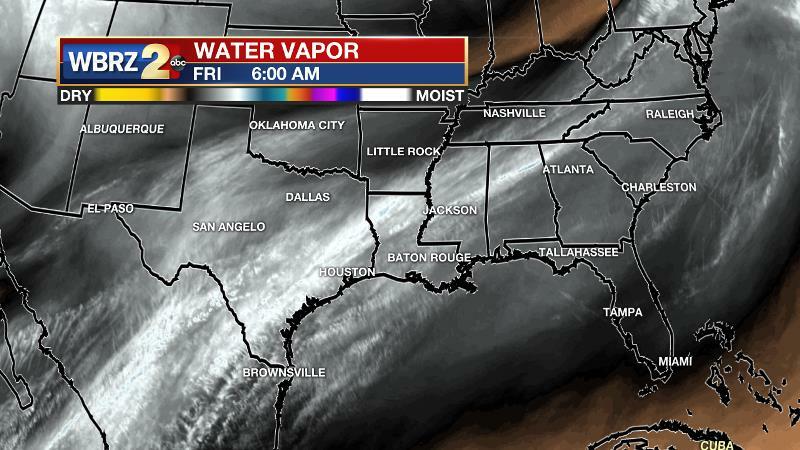 Lingering mid level moisture will cause some clouds to stick around. Some times of sun are possible but should be fewer and farther between. The cool stretch will be short, ending by Sunday. A warm front will lift through Sunday night and put showers back into play for Monday. Then a cold front will move into the forecast area and introduce more rain and thunderstorms on Tuesday. A trough moving across the northern two thirds has allowed a cold front to push into the Gulf of Mexico. Highs and lows will tumble by a good 25 to 30 degrees for Friday and Saturday. The cold front is expected to stall in the central Gulf and retreat north as warm front by the second half of the weekend. Continued southwesterly flow aloft will keep a mid to high level cloud deck in place through much of the weekend. Certainly, some times of sun are possible but do expect clouds to be the dominant feature. Milder air and showers will return late Sunday into Monday as a warm front encroaches on the Gulf Coast. The next trough will track a bit farther south and potentially taking on a negative tilt owing to at least the possibility of some thunderstorms with the next cold front on Tuesday. It is still unclear as to whether or not severe weather could be an issue and if this front will make a clean passage or not. Forecast models have been performing poorly with temperatures beyond the 5-day time frame, so averages were used in the forecast for now.